One of our most dedicated garden members, Graeme, has definitely worn the crown of 'head pizza chef' at The Lost Plot. He is the king. 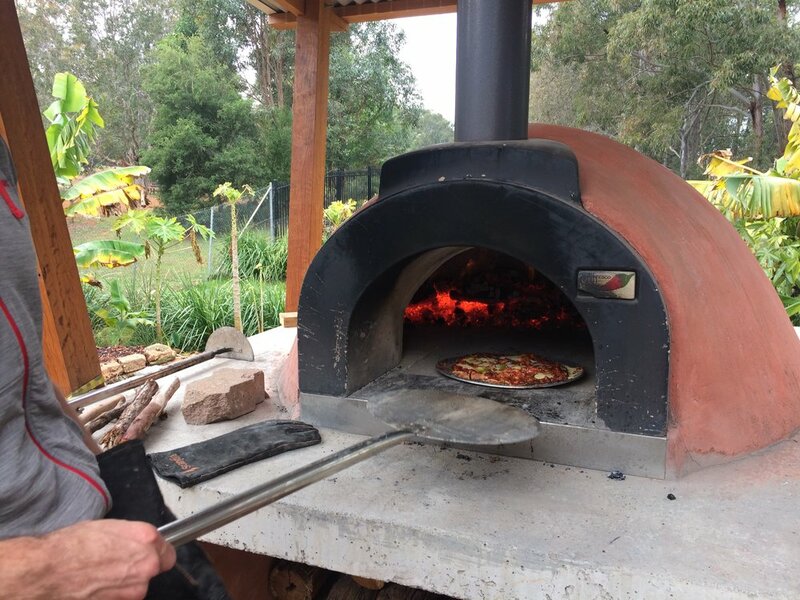 The pizza oven has been up and running for over a year now, and with Graeme's expert lead it has been churning out pizzas at most Thursday morning working bees, occasional Saturdays, and at many of our events. 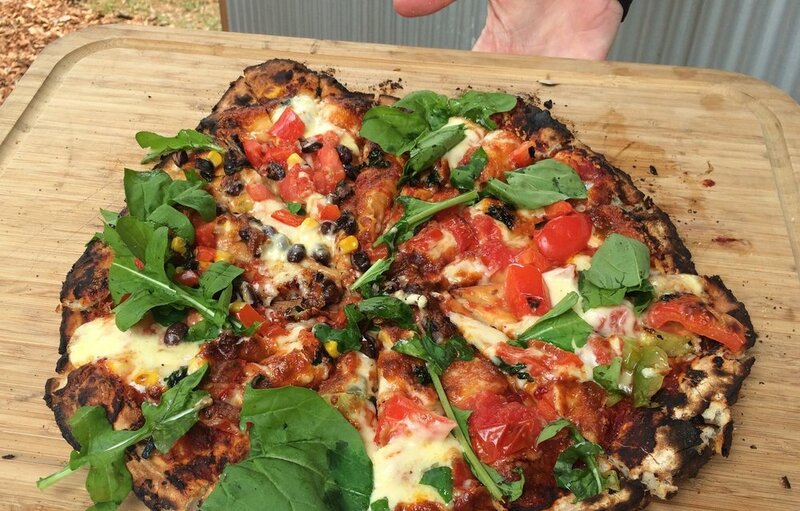 But in the spirit of sustainability, which is what we're all about, Graeme keeps reminding us that we need to be able to cook pizzas without him. "What if I'm not here one day?" he asks. Please don't leave us Graeme! But it is a good point - we need some pizza Queens and an expanded pizza-making royal family to ensure long-term sustainability of our pizza-eating habits. Take 475 g of any flour but 00 and the Laucke brand are Graeme's preferred. If you wish to reduce the amount of flour, you can substitute up to 150 g of semolina. Mix water, yeast, sugar let sit for 15 mins until foamy. Add oil. Combine the yeast mixture with your flour combo until a firm dough is formed. Roughly 10 minutes by hand, or four minutes on low in machine. Rest for three hours then punch down and lightly knead, three or four minutes. Make two round balls out of dough. Now you can freeze until the day you want it. Or place, covered, in the fridge overnight and then use the next day. If you wish to make a dough, and try it out in the Garden's pizza oven, bring it along to a Thursday morning working bee. Ideally bring a few of your own toppings as well, but we usually have the basics, and the garden is a good supply of fresh herbs, etc! Light a small fire in the centre of the oven but slightly towards the front. Gradually add to the fire over the next half an hour, every ten minutes or so adding 5 or 6 medium sized branches or roughly arm-thickness pieces of wood. Between 30-50 minutes add one or two larger pieces, moving towards the better hardwood. After an hour to an hour and a half, add one or two large pieces of hardwood. Smash up all your burning wood to reduce most of it to smaller coals and pull it towards the front. We want to cover all the bricks inside the front with an even layer. Let it burn for ten minutes, then push all the hot coals to one side or the back. Throw a small piece of wood, a 30 cm stick essentially onto coals as you put each pizza in. The stick with alight and create a circulating blast of warm air. To the side is better as the hot air isn't circling towards you but to the back makes it easier to fit three or four pizzas right in front of you for easier management. Just watch out for the hot emergent air. Traditional way to check if its hot enough is to chuck a small handfull of flour etc onto the front floor bricks. If it burns black immediately its probably a little hot. A few seconds, better , about ten seconds, ideal! To use or not use metal pizza trays. Do you like ash on your pizza base? If so then put it on the floor of the oven. If not then use a tray and dust it with semolina or polenta before adding your base. I start on the tray, move to the floor after two minutes, then back on the tray. Theory being the base collects less ash when its a bit cooked. Rotate your pizzas at least once as one side will be closer to the fire and likely to blacken if you don't do this. Don't use the metal door on the front for pizza making. It is good for bread making when the oven drops to 200 degrees ( about an hour after your pizza cooking). You can use the door as a dampener of the fire if you wish to slow things down but only have it at about. 45 degree angle. When you have finished move all the coals back across all of the floor to speed up burning. When you are ready to leave, push it all to the very back of the oven. Best time and place for answers is at The Plot on a Thursday morning. The working bee runs from 9-12am (8-11 in Summer). We look forward to crowning more Pizza chefs in the garden! Will you be next?